U.S. companies turning into foreign-controlled U.S. companies are the news: for example, Burger King and the Canadian coffee-and-doughnuts company Tim Horton's; Medtronic and the Irish firm Covidien; or back in 2009, as part of the U.S. auto industry bailout, the autoparts maker Delphi emerged from bankruptcy, with assistance from the U.S. government, as a British-based firm. Mergers: Tax Issues," published on May 27, 2014 by the Congressional Research Service. But here's a sketch of the main issues. A foreign-controlled domestic company in the U.S. still needs to pay U.S. corporate taxes on its U.S. operations at the U.S.-imposed rate, of course. But two other issues remain relevant. One is that the U.S. is the only major economy in the world that seeks to tax its companies on their global profits--not their national profits--and to do so at the relatively high U.S. corporate tax rate (although this U.S. corporate tax is postponed until the funds are sent back to the U.S,) When a U.S. company turns into a foreign-controlled firm, it is only taxed on its U.S. operations, not on its global profits earned in other countries with lower corporate tax rates. The second issue is that companies often have ways, in how they set internal accounting prices in the company for provision of certain goods and services, and how they set up their financing, of making profits appear in one country rather than another. 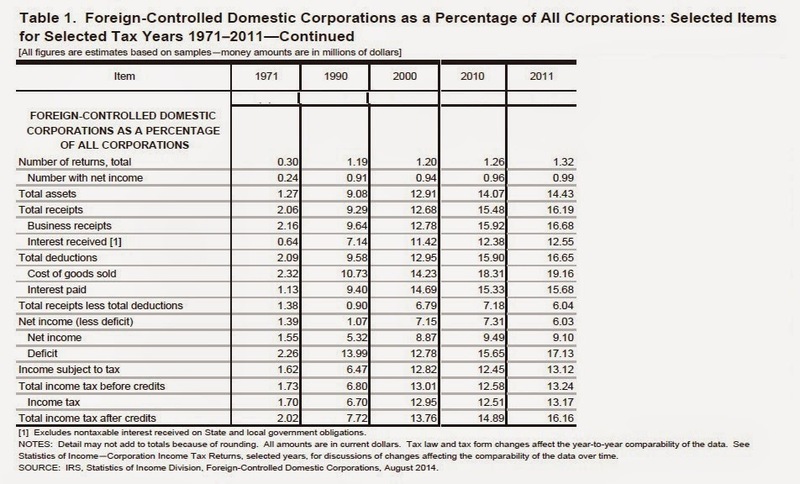 How prevalent are foreign-controlled domestic corporations? 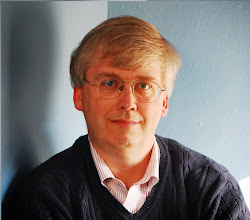 James R. Hobbs provides some basic statistics in "Foreign-Controlled Domestic Corporations, 2011," in the Summer 2014 Statistics of Income Bulletin, published by the U.S. Internal Revenue Service. While this statistics give a sense of the issue, it's worth noting that Hobbs is collecting data on U.S. domestic companies that have more than 50% foreign ownership. There are also foreign companies that have a U.S. subsidiary--which isn't quite the same thing--and companies that have their legal headquarters in another country even though a majority of the business sales and the shareholders are in the U.S.
corporations that "collectively reported $4.6 trillion of receipts and $11.7 trillion of assets" to the IRS. "While Federal income tax returns for FCDCs accounted for just 1.3 percent of all United States (U.S.) corporate returns, they made up 16.2 percent of total receipts and 14.4 percent of total assets." 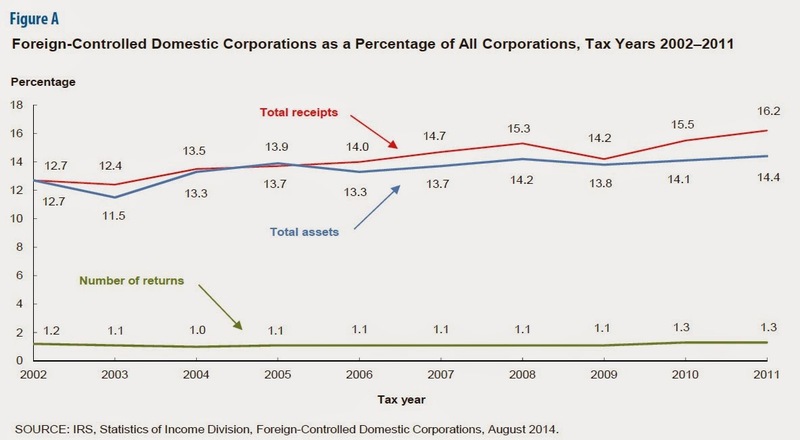 Here's the gradual rise over the last 10 years for the share of foreign-controlled domestic corporations, relative to all U.S. corporations, in receipts, assets, and as a share of tax returns. Although there is some increase in recent years, a lot of the increase happened before the 21st century. This table is a slightly cut-down version of one appearing in the Hobbs paper (I cut some of the years to make the longer-term trends easier to discern). For example, total receipts of foreign-controlled domestic corporations were 2.06% of all U.S. corporations in 1971, 9.29% by 1990, and 16.19% in 2011. Assets show a similar pattern. Total assets of foreign-controlled domestic corporations were 1.27% of all U.S. corporations in 1971, 9.08% by 1990, and 14.43% in 2011. In which countries do the foreign owners of these domestic U.S. firms live? Here's a figure. You'll notice that essentially none of the foreign owners are in true tax havens like Grand Caymans or Bermuda. A law passed back in 2004 denied (or greatly restricted) any tax benefits from being based in a county where almost no actual sales or production happened. Thus, the current wave of foreign ownership is about being legally based in places like the UK, Ireland, Canada, and so on. 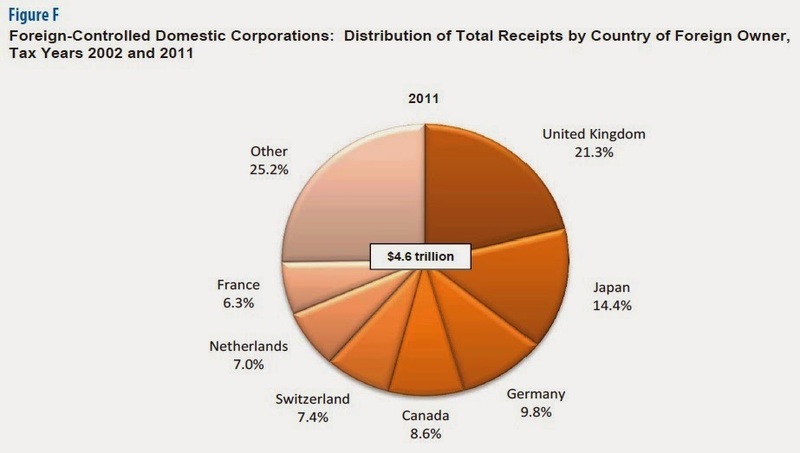 Foreign-controlled domestic corporations can have more than half the sales of all U.S. corporations in some industries. For example, such foreign-controlled firms account for 78.3% of all receipts of U.S. corporations in the "Breweries" industry --for example, Anheuser-Busch is owned by the Belgian-headquartered firm InBev. Such firms also account for 64.1% of all U.S. corporate receipts in the "Audio and video equipment manufacturing and reproducing magnetic and optical media" industry; 62.7% of receipts in the "Sound recording industries"; 59.6% of receipts in the "Engine, turbine, and power transmission equipment (manufacturing)" industry; 59.5% of receipts in the "Security brokerage" industry; 54.1% of all receipts in the "Rubber products (manufacturing)" industry; 53.5% of all receipts in the "Electrical and electronic goods (wholesale trade)" industry; 51.7% of receipts in the "Cement, concrete, lime and gypsum products (manufacturing)" industry; and 51.4% of the receipts in the "Motor vehicle and motor vehicle parts and supplies (wholesale trade)" industry. The best way to tax global corporations is a sticky problem, and I'll come back to it on this blog from time to time. In a globalizing world economy, the issues are only going to become more salient with time. But here, I'll just note that if the U.S. followed the pattern of just about every other high-income country in the world and had a corporate tax that was territorial--that is, aimed only at corporate income earned in the U.S.--the reasons for U.S. corporations to put their headquarters in another country would be much diminished.